At first glance, Thlides sounds as if it could be a dusty old Greek tragedy with a mutilation fetish. It turns out to represent what happens if you try to say 'slides' with a lisp. 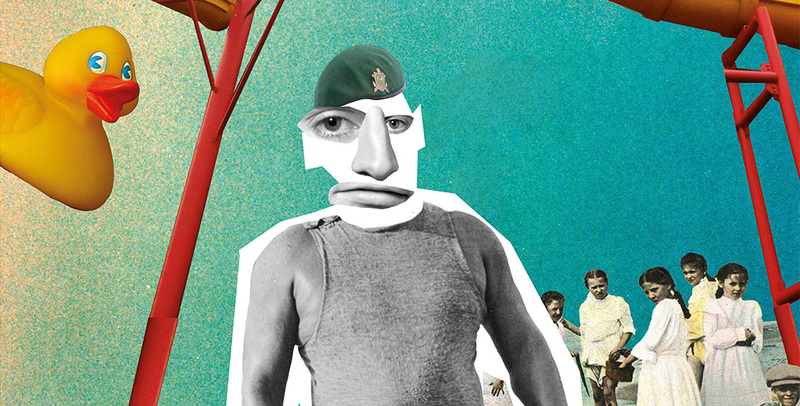 What the play transpires to be is similarly opaque: entirely set in the splash pool between two slides at Butlins, about a psychologically bruised army vet called 'Spawny John'. Sat in a paddling pool filled with polystrene packing foam, Spawny John sits, playing with his phone and gently sipping soup. He's soon joined by a friendly rubber duck, and then a procession that includes (but is not limited to) a hyperactive/horny frog, abusive 'greebly' teenagers, a tiny Chinese dragon and a snooty Scandinavian lion lilo. They mostly talk about biscuits. There's faint shades of Beckett in the single location and purposefully dowdy dialogue, and the play bravely flirts with intentional dullness. Thlides is peppered with neat writing flourishes, one of my favourite being the characters scolding each other for making Batman references when a high-brow audience like us would be far more likely to want to know about Nietzsche. Similarly, all five performers, Lydia Lakemoore, Rosie Grundy-Orchison, Ashley Winter, Grace Felton and Louise Wilcox, turn in a memorable set of grotesques and weirdos. I was a particularly big fan of Grace Felton's gruesomely caricatured teenage boy, all elbows, squatted knees and a twisted scowl - like something that'd leapt out of a Bosch painting. Lydia Lakemoore, in centre stage throughout, also turns in a performance that spans the emotional gamut, obviously vulnerable, but so whacked out on antipsychotics that she spends the whole play in an emotionally neutral haze. Late in the play, when Spawny John encounters his doppelgänger, Lydia does a subtle bit of cheering up that allows the play to end on a strange but vaguely positive note. That said, for all the good stuff listed above, I didn't enjoy Thlides. Mostly because surreal humour grates on me like nails down a chalkboard. The style of comedy reminded me strongly of The Mighty Boosh, a show that I've never enjoyed in the slighest. My problem with this style of comedy comes from being expected to laugh at simple non-sequitur strangeness; for example in Thlides an inflatable Norwegian lion-shaped lilo passes judgment on Spawny John's hat. There is no punchline. That is the gag. Lol. So random. Simon Amstell put it best in his blistering takedown of Noel Fielding: "Is that how it works? You just throw out funny words like hippopotamus and juggling? Anyone can do that." It's an intrinsically lazy form of humour and Thlides relies on it as a crutch. Consequentially, by about the half-way mark I was first struggling to care, then fighting a losing battle not to drift off to thoughts of what I was going to have for dinner. Considering that the play is a brief n' breezy 50 minutes long, boredom isn't exactly ideal, but by the time the characters were engaged in an aimless chat about Jaffa Cakes I was itching for it be over. This just isn't my cup of tea. Legions of people enjoy this style of random comedy but to me it's like gazing into a comedy abyss. I give everything I review the benefit of the doubt and try to engage with it on its own terms, but, frankly, I struggle to see the point of Thlides. Thlides is on tonight only (23rd August 2016) at the Lion and Unicorn. Tickets here.